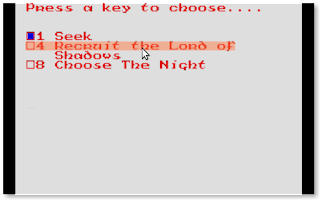 I've had an email about how to recruit on my [edit - no longer available] Android Lords of Midnight remake - "the War of the Solstice". That means other people are probably stuck too and haven't asked. Here are the basics. From the start of the game, go Northwest, Northwest, Northeast and you'll stand on the same spot as the Lord of Shadows. Here I've done it as Morkin, but you can use any of the starting group. Now touch the name part of the text (where it says "Morkin. He stands in the Forest of Shadows, looking Northeast."). This brings up the "Think" screen. On this screen, touch the right hand part of the text. This brings up the "Seek" screen, where you can do the recruiting. On here, touch the option to recruit the Lord of Shadows. That's it! Image via WikipediaLast week Google released the latest numbers with the percentage of each Android version accessing the Android Market. What really jumped out at me is the rise and rise of Gingerbread (2.3.x), and the fall of Froyo (2.2). In the past I've been a bit skeptical of Google's commitment to older versions of Android. Looking at the way things advance, it makes no sense for them to dedicate resources to try and make life easier for developers on older devices. Every year the release 2 versions ago more or less disappears, or that's the way things have been tending to go for the last couple of years at least. Here's a graph of how the relative percentage has changed over the last 18 months. I've occasionally jotted down the percentage numbers in a spreadsheet, and the rest I got from the Wayback Machine. I've lumped minor releases together, so 2.3.1 and 2.3.2 are in the 2.3 bucket. 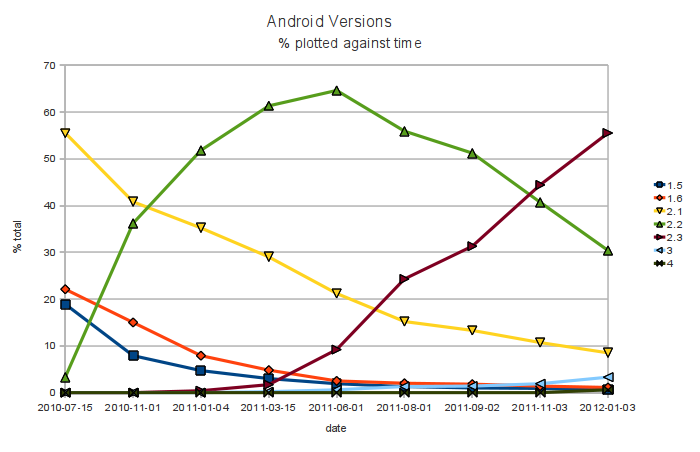 Version 2.1 (Eclair) is slowly disappearing, despite being at 55% back in July 2010. 2.2 (Froyo) is at 30% now, though in mid 2011 it peaked at 65% of the Google-approved devices online. Right now 2.3 (Gingerbread) is on the rise. I think the poor showing of 3.0 (Honeycomb) confirms that the driving force behind these numbers is mobile phones, rather than tablets. For those not paying attention, Honeycomb is only available on tablets, you see. Given all that, here's my predict-o-graph of how things will go in 2012. The yellow area marks my completely arbitrary prediction values of how the percentages will change. I've pulled the numbers out my /dev/backside. If everything follows the same pattern as previous years, by early summer 2012 Gingerbread will have peaked at about 60% of the market. By the end of 2012, Froyo will be on fewer than 10% of devices, Gingerbread will be on the slide, and the newest Android release - Ice Cream Sandwich, version 4.0 - will be taking over. I don't think Honeycomb is going to grow much this year, and the relative percentage of devices with 3.x may even shrink. No new tablets should be released with Honeycomb this year anyway - if they are released, they won't sell very well or will be upgraded to ICS pretty quickly - and most new or new-ish phones will have or get ICS too.